If your math's good, you will have noticed that there were still about 2 cups of unused chickpeas still left from the original 4+ cups that I had to Do Something with after I used 2 cups for the Guyanese Channa I wrote about yesterday. If it's not then you, like me, were strongly encouraged to take a remedial math class before taking any required math courses in college. Ah well. Now that I knit, I'm learning all the math I never learned in school. Who knew? Where was I? Oh yeah, the chickpeas. Because I had such a plethora (god, I Iove that word) of chickpeas, I didn't want to make yet another main dish. My chickpea tolerance is actually fairly low and I've only recently developed enough of a taste for them to be able to eat them in their whole form instead of disguised as hummus or felafal. I was looking for something different--something light, which is oddly oxymoronic for chickpeas, I think most people would agree. Since I didn't really know what I wanted, I decided to surf online rather than going through my cookbooks. I went to Allrecipes.com, a good resource when I have an ingredient in mind and I'm looking for new ideas of what to do with it. 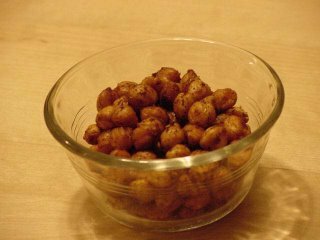 I searched through the chickpea recipes and found this recipe for Roasted Chickpeas. I have to admit right off the bat that I played with the spices. I added chili powder and I think it was a good addition. The only thing I didn't do right is that I didn't cook it quite long enough. I had trouble keeping my oven at 450 deg. As a result, most of the chickpeas didn't dry out completely so they're a little chewy. Even so, they came out really tasty. I plan to make these often--they make a great grab-by-the-handsful snack. And healthy too! And it tastefully (tee-hee) solves the problem of what to do with the rest of the chickpeas whenever I cook them up.